ASTM D-1559 AASHTO T-245 For determining the resistance to plastic flow of cylinder specimen of bituminous paving mixture loaded on the lateral surface by means of the marshall apparatus. Machined steel, galvanized, 10 lbs, hammer weight, 18″ drop height, for sample 4″ dia. Machined steel, quick clamping system , for mold 4″ dia. 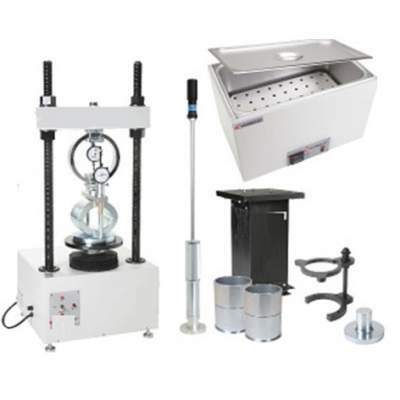 Steel frame, hydraulic system, for sample 4″ dia.